I've been looking at the Botes for awhile. Would love to get a SUP this summer. Have you looked at the LiveWaterSports L2Fish model (12') or the L4Expedition, (14'), at all and if so any comments / thoughts. 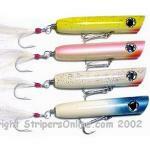 For the most part they seem a little lighter for their length than the Botes and a little more affordable. 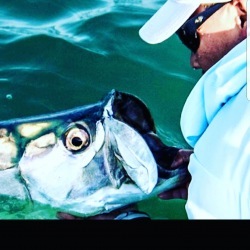 You also have the option for easily adding a trolling motor or small outboard where you would have to move over to a Rover in the Bote line to get that option, with a considerable weight gain. 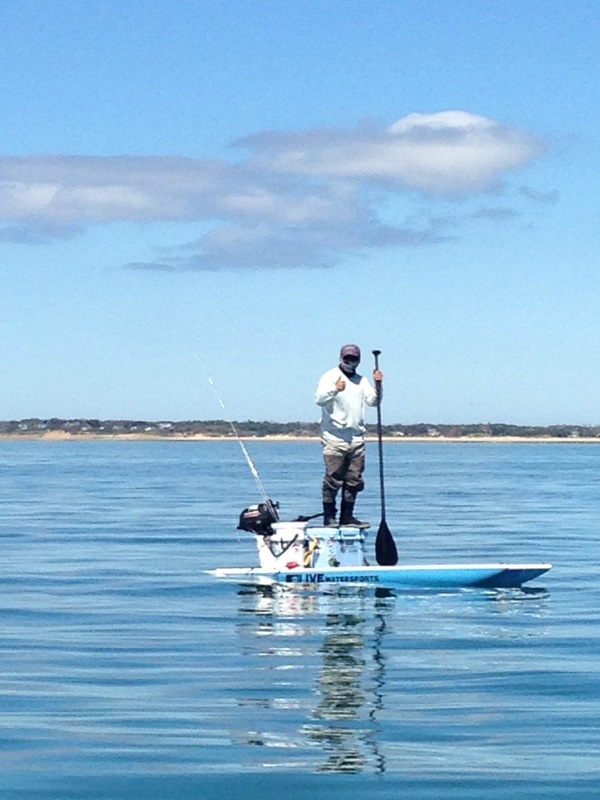 Stability is what impressed me on the LiveWaterSports SUPs as one of the videos shows a user hanging 10 on the edge of the board and staying upright. I'm 6' tall and only 9-1/2 shoe and balance has always been an issue. Thinking I'd need a leaning rack on a stable board. Do you use a leaning rack and if so does it help much ? @HillTop the L2FISH is the most stable most durable( full carbon )and the lightest @51 lbs but you're going to need to dig deep @2,300 big ones for the 12' model still less expensive than the rover and half the weight .I tried flipping it you'll be in the drink before it flips.I feel its the ultimate board. I have a 2.5hp but considering a trolling motor with Gps for auto pilot and anchoring assist that will let me hold a certain area where there's current. 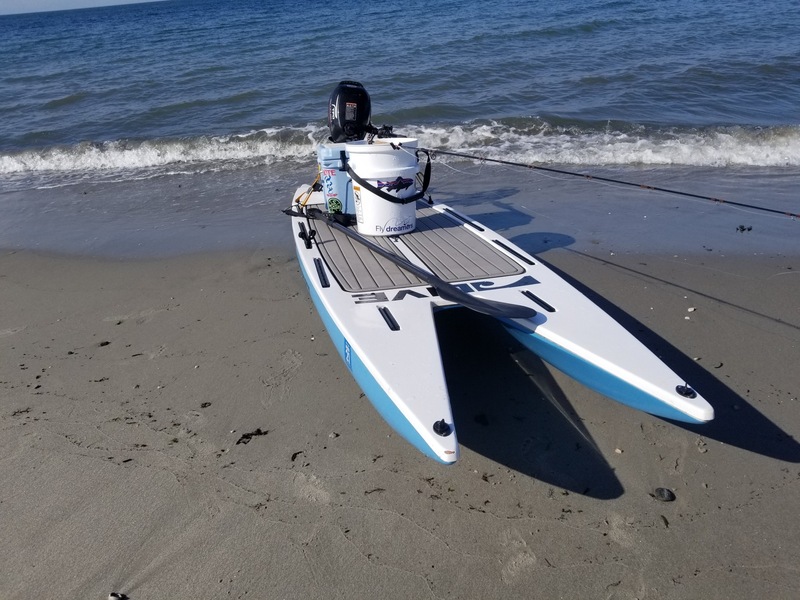 I've been looking at the seaeagle fishsup 126. It's as wide as a sheet of plywood. I haven't tried any of the LiveWaterSports offerings. At 51 lbs, though, it is 60% heavier than the Bote HD. Speaking only regarding weight, and thinking of where I tend to fish...not sure I could manage 51lbs of board, 15lbs of anchor, a paddle, rods, water, etc, etc, etc. and a MOTOR? The simplicity of it all is gone at that point, in my view. It's a balance of what you want to do and how you want to do it. Have there been times I've launched from north fork and wanted to sight fish an area on the south fork? Oh yeah. But I've also learned more about the spots I fish by being limited in how far and fast I can run away from them. The best times I've ever had on a board came from driving all around the albie haunts from the Cape to SOCO wihle not seeing anything, only to pull into a lot in the afternoon on a Tuesday, walk through the dunes, see no one on the water...then SPLASH...they're here!! Run back to the car, grab the board off the roof, slide the rod under the bungees, grab the paddle and anchor and launch in sometimes scary looking shore-break surf by holding the board and timing a jump in, then be hooked up in less than 1min. I'm not sure I could do that with 50+lbs of board. The L2Fish seems like a really nice platform, though. I have a sketch from 10+ years ago of a catamaran row boat for lakes I dreamed of building. I'd go to a shop and ask if I could carry it around for a few minutes even trying to switch hands...and ask them if they could have 20mph gusts try and blow it all around while I walk, too. If you were using it only for sight fishing would that be your choice? I see you kneeling a lot in your footage. If you had to be standing and double hauling a good distance (relatively speaking) would you still go with that? My home waters have very easy car to water access but I'd never want to be restricted to only my home waters. A huge thing that has not been discussed here is hull design. 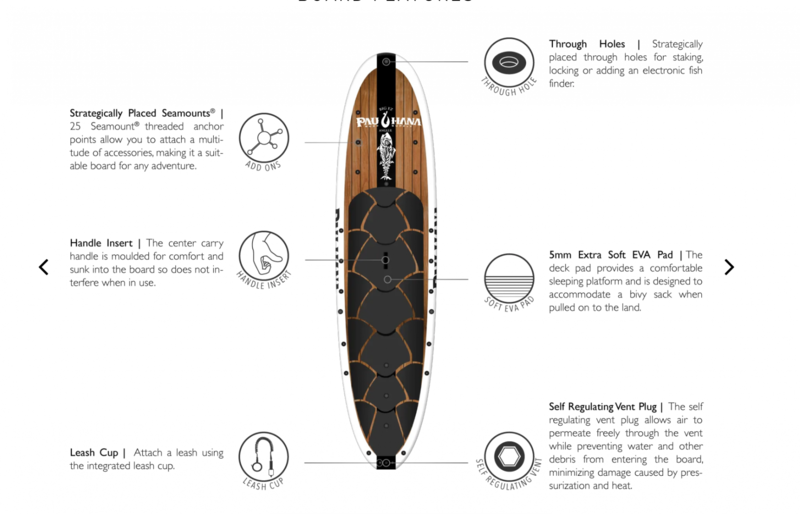 If you are wanting to use your SUP for sight fishing skinny water i highly suggest a v-hull or tunnel hull of some sort. 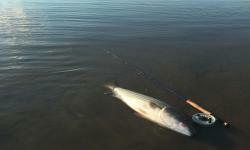 My flat bottom sup is good for very calm days without chop, but on windy days hull slap is a big problem for me. 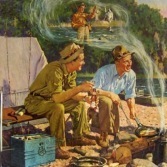 I usually drop my anchor and wait for the fish to come to me. When there is chop on the water there is a constant hull slap noise and it seems like the fish are way more spooky as they get close to me. On a calm day when they seem more relaxed even though they can see me better. 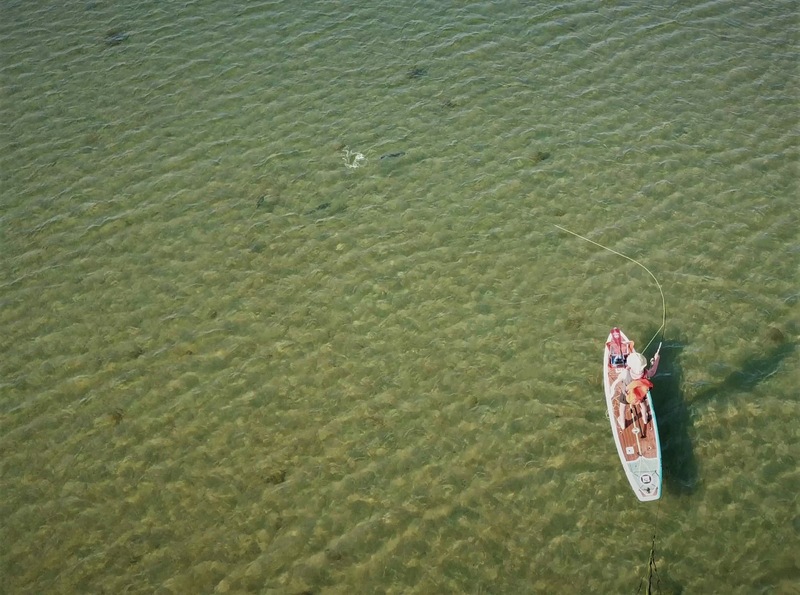 Note I have never used a SUP like a BOTE or Dragonfly that has a V-hull...but if it minimizes the hull slap sound that would be huge on the skinny water flats. If I had one choice, I'd stick with a hard board, no motor, under 35lbs, and at least 12ft, and more than 31" wide. To me, that gives me the stability of the platform and ease of use. My wife has the HD 10'6", which is 30" wide. Totally different experience for me (6' 175lbs, size 10.5 shoe), I did not feel stable on that board. I kneel a fair amount in open water because it can get sketchy with boat traffic, varying wave direction and currents. Sight fishing, I'm always standing. The chop on flats is rarely bad enough to make me kneel. Every once in a awhile in Brewster boaters will cruise and their wakes rise in the shallows and break. If that's coming, I'll kneel for a sec. That's the drift sock off the back. Overhead imagery doesn't do justice to the chop or glare, but it's there. 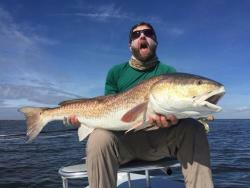 I have zero problems getting off big casts from standing on flats, or in open water. There's a clip in the albie section of SIFF18 off the south Cape where I'm standing, rushing to get to a feeding school, then getting a decent cast out. Some days I would like a motor, but there are probably more days where having a more complex setup would be undesirable. There's a lot going on already, you've got line laying everywhere (you can be a line control master-demon, and it will still be an issue), a paddle to keep track of, an anchor if you're wise, a drift sock if you want to drift a flat slooooowly, and I'd just prefer not to have much else to think about. Very cool. Although cat like, I’m quite a big heavier than you so I think I should adjust my board size accordingly. I think to start I’d like to do the paddleboard right then jump to a microskiff. Instead of starting with a nanoskiff. Right now I don’t have tons of time to set up, break down, and flush a motor. But I do see your point - simple is always better. Those are the weights for the gatorshell version. The pre-gatorshell HD12 is 32lbs. I can weight it tonight to double check, but those are #'s for the gatorshell. And I checked their site, it looks like they don't sell the non-gatorshell HD12 version any more...or make them new at least.